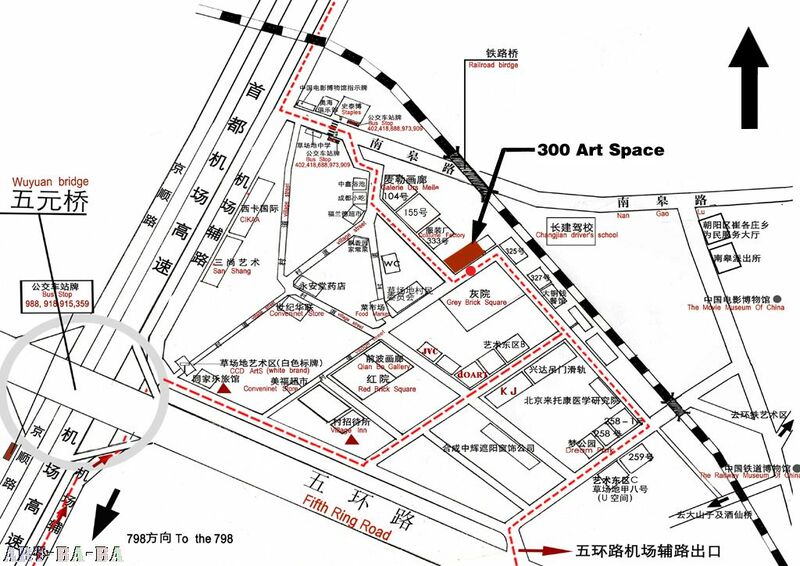 (Beijing, March 9, 2009) – The Opposite House in partnership with Pékin Fine Arts has begun exhibiting new art works by artists Bai Yilou and Movana Chen in the hotel’s Atrium. A native of Luoyang, in China’s Henan Province, Bai Yiluo exhibits Camouflage Jackets. 70 individual men’s coats are on display, each pieced together from the delicate pages of supermarket advertising supplements. On display as well is a single men’s jacket constructed from black and white passport photos stitched together with red and black thread. Movana Chen, from Shantou in Guangdong Province, exhibits Body Containers. This 4 piece mixed media installation is comprised of shredded magazine pages hand-knit together to form human shapes. The exhibition in The Opposite House Atrium runs until the end of June. The Tate Britain has loaned its collection of over 100 major works of artist J.M.W Turner. This exhibition will showcase the oil paintings of the artist, considered as one of the greatest painters Britain has ever produced. Highlights of the show include one of Turner's finest piece Snow Storm: Hannibal and his Army Crossing the Alps 1812.
luminate is pleased to invite you to a photographic exhibition featuring Laos: Sabaidee ISO 3200.
luminate is a project organized by professional photographers. Each year, we select a different country to travel and photograph. We had the great pleasure of visiting Laos and brought back with us not only beautiful photographs, but memories of the gentle smiles and calm devotion of the Laotian people. We were also impressed by the collaboration of local and international efforts to promote sustainable development. In particular, Stay-Another-Day is a consortium of small businesses promoting responsible tourism; and Saffron Coffee markets coffee grown on the Northern Laotian mountains replacing what used to be opium fields. We would like to pledge a minimum of 10% of the exhibition profits to support these initiatives. Our exhibition is held in collaboration with Piazza Italia under Crai, a company who shares our passion of bringing together people who are fascinated by different cultures. Thai artist Navin shares his perspective of China through sculptures, installation pieces and paintings. His center piece is an interactive board game where visitors can choose their roles and win high stakes in contemporary art. Complementing the game is a large-scale painting that portrays icons and superstars of Chinese art in a Bollywood poster style. Curated by renowned artist Qiu Zhijie, this show features the works of two emerging artists Ye Nan and Ding Ding ranging from paintings to multi-media installations. The two artist developed opposing considerations of refusal and acceptance. Yan developed an immune system that protects himself and Ding achieves her personal successes through giving without compromise, creating the works for this exhibition "immunity". Famous Swedish artists Ulla and Gustav Kraitz will hold an art exhibition at the Capital Museum. The exhibition will showcase ceramic sculptures inspired by an ancient flame firing technique from the Song Dynasty. The Kraitz are the only contemporary artists to successfully revive this ancient Chinese practice. The game Hide and Seek refers to a cat and mouse strategy that shifts power back and forth between the hider and the seeker as each takes turns. 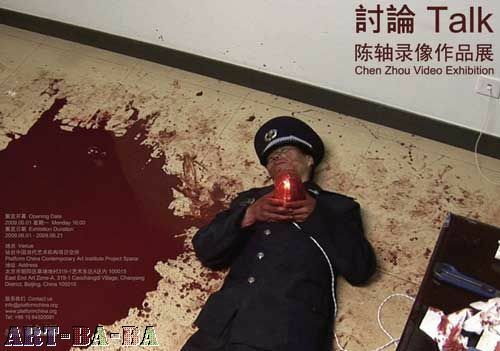 In the context of Tian Taiquan’s exhibition, the game also refers to the tragic case of Li Qiaoming, the 24-year-old prisoner who was murdered by his inmates, supposedly during a game of hide and seek, and is the subject of one of the artist’s blog portraits. In the Lost and Marks series, one could say that the artist also plays hide and seek with the human figure, making it disappear beneath a uniform, fragmenting the body, morphing it into a tombstone, or submerging the figure within a rococo display of identical Mao buttons. Mining universal themes of sacrifice, death, the yearning to commune through language and identification - and the converse, effacement through enforced ideology - he probes the human psyche at the place where it transcends the borders of a nation or particular time, while at the same time reflecting on his own historical circumstances. Tian Taiquan uses digital technology and filmic techniques of editing, montage, and staging to create a dynamic dialogue between the past and present. In his Jin Ping Mei series, he translates the Qing Dynasty style of sketching to realistic digital characters drawn from the banned book Jin Ping Mei or The Gold Plum Vase, written during the Ming Dynasty. The novel was considered China’s first piece of literary realism, and scandalized people because of its explicit sexual scenes. Tian Taiquan resurrects this buried treasure, upholding the womanizing main character as a kind of mirror of the times. Most recently he invites viewers themselves to participate in his work, thus altering the history of art and history itself by entering into his interactive space for discourse. 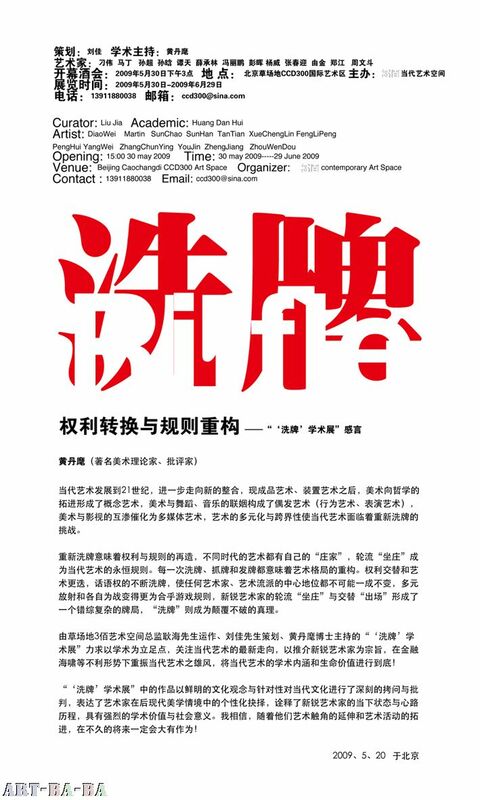 Curated by Feng Boyi, Magee Art Gallery is excited to present "Self-Preservation: Painting Exhibition of Cui Jie, Li Chao and Wang Yuanzheng" in Beijing and Madrid. The painting practices by the three young artists vary greatly in thematic and technical dimensions. Cui Jie never allows her female identity lead her painting practice; she takes special interest in exploring all sorts of dissociative relationships between “vision” and “painting”. Li Chao is experimenting on a unique form of painting series, attempting to disintegrate the restriction of the logic of time and space. Different from Cui Jie and Li Chao who attach more importance on visual mechanism, Wang Yuanzheng’s paintings put more emphasis on the realization of the internal dimensions outward, revealing and symbolizing the relationship between the painting language and the psychology. Inspired by the title of Luis Buñuel’s 1977s’ film “Cet obscur objet du desir”, the new group exhibition opening at offiCina space in Beijing Factory 798 on May, 9 2009 showcases works by British-Indian, Chinese, German and Italian artists. Stylistically different, the artworks convey each artist’s personal aesthetic of the ‘object’ as a subject of art and a vehicle to extended meanings. Representing the object and its re-use has marked some very important moments of modern and contemporary art from the historical avant-gardes to our days. By recontextualizing or subverting the object, artists have emphasized the ambiguity of the representation renovating and desacralising the work of art. Objects offer an inexhaustible repertoire of forms and the notion of ‘object’ is basically ambiguous as the word refers to several meanings. An object is anything that is visible or tangible and is relatively stable in form, but it is also the end toward which effort or action is directed; goal; purpose. In Buñuel’s film, two actresses alternating on the scene perform the principal female role and ‘object of desire’. They are constantly contrasted to highlight the duality and ‘obscurity’ of the theme. This exhibition moves from the dichotomy between the real object and the represented object addressing its ambiguous status and manifold aspects. Artists refer to objects in multiple ways and perform thought-provoking ideas reusing them into their artworks. This discourse on the object is also a pretext to open up a debate on the question of when we see something, when we do not see something, what we think it is. The ‘object’ explored in each piece in the exhibition shows an area full of nuances, duplicity, and subversive flare; a seductive field to investigate the interplay between thought and vision. In other words, it is the power of art that visualizes what lies behind and beyond the ‘fabric of things’. These objects suggest the extent to which the meaning of this subject matter may be fluid and play upon ambiguity. “Kunstwerke 36” derives from a dream of the artist. This video work by Italian artist Alba d’Urbano quotes - through the mechanic dance of German performer Tina Bara - Martha Rosler classic feminist video “Semiotics of the Kitchen” (1975). Here the subconscious is the starting point for the creation of an artificial (real) world. The performer presents viewers with small household appliances through unexpected gestures that depart from the normal use of tools and seem to follow the guidelines of an unusual instruction manual. The setting is not a real one but the slow motion images of 1960s’ 007 films and interiors of 1970s’ apartments. In those years, women started to familiarize with new multipurpose objects created for the house. Frontally shot, the robot-like movements of the performer follow the tune of Ide Hinze’s “Okay” that adapts the fragments of a lesson by American poet Allen Ginzberg. The household objects presented in mechanical succession are turned into small enemies opposing the identity of the woman who slowly homologates with the indefinable background losing her characteristics. The performance subverts the everyday objects that thus become functional to the discourse of objectification. The end of each new scene interrupts the rhythm with a sudden and explosive ‘break’: maybe a refusal of such schematisation. Another video performance shows a different and again interesting rendering of the object. The author, Kiran Kaur Brar is a young British artist of Indian origin whose practice reveals her interest in questioning the notion of identity and challenging the idea of a fixed political and cultural position. Her looped video work “Passport Lahloh” (that translates ‘come and get your passports’) documents a happening, which took place close to the border between India and Pakistan. Setting up a temporary stall at the market, the artist offers obviously fake British passports to a quickly gathering crowd. The crowd responds with calm dignity, but what viewers see is an unsettling, quietly powerful scene referencing the complex politics of place, foreign policy and economics. By juxtaposing cultural and emotional elements, this work attempts to create hybrid encounters and looks into expectation. It draws upon illusion and the ambiguity between real and false. The real object and the art object coexist in a tension that gives it a peculiar dynamism. The alternating roles of the object within the specific context combine to portray it as the ‘object of desire’. As stated in an interview with critic Carol Lu, entering Liu Ding’s world ‘you will discover that all common and familiar materials end up appearing unusual’. He thus challenges our visual experiences by transforming the physical existence of an object and making it appear in the form of something different. He participates here with two works. The small sculpture “Mushroom” materializes the idea of the longed for object into the three-dimensional shape of a mushroom created from countless little white capsules. Medicines are attractive because they promise to prevent disease and to keep the body strong, drugs allow people to dream and provide a desired escape from daily stifling life. In today’s ‘medicalized’ society, these clusters of pills perform the task to nourish our desire for safety but their shape reveals the trick, the poisonous aspect. The second work is a new photograph entitled “Art is Everywhere”. It reproduces a fridge mistaken by the artist as a work of art at London’s Tate Modern. A text recording the thoughts of the artist - similar to a meditation on this distortion - is added on the photographic object in the manner of ready-made. This work poses the questions: what is art? To what requirements must an artifact comply to be classified as a work of art? and has its place on the pathway that was opened by Duchamp (and followed by others among whom Bertrand Lavier etc…) when he questioned the boundary between art and non art. Part of a new project entitled “I Wrote Down Some of My Thoughts” it confronts with new ways of perceiving things. It is this peculiar verbal dimension that -by insinuation- involves the mind of the viewer in the perception of the work through short circuit of sight in favour of thinking. Other photographs belong to the series “1+1” by Zhao Liang. These digital prints in black and white hold a subtle tonality akin to silver gelatin. The images are pairs of objects standing or leaning against cracked walls. Everyday items - two tattered umbrellas on a water-streaked wall, two rusting urinals, two mangy mops, and two worn coats are transformed by the artist’s camera into objects of surprising beauty. He imbues them with an oddly anthropomorphic presence, surrealist nature. Posed as if suspended in time, they seem to come from some middle place and attract the viewer toward the mute world of things, to the realm of dream and unconscious. They may suggest by association bodies absent from the scene that potentially have been there. These objects exist as doubles and even though are items of the same type; some details characterize each one of them creating the illusion of their inner humanity. The ruined setting adds to the mysterious, sombre magnetism that irradiates from them. We are gripped by the magic quality of these images, a quality we find in other works of the artist who creates a peculiar poetic from everyday life, common things and unprivileged people. In his multiform practice (documentaries, video, photography) he moves along the ridge of public space and intimate details creating metaphorical scenes of today’s life and revealing specific psychological states. While documenting everyday life he has the ability to single out and record the ambiguity that is part of the essence of human existence. For this exhibition, Italian artist Girolamo Marri contributes “Four Flags” a sketchy reproduction of a “Three Flags” painting by American artist Jasper Johns. The piece, produced after the artist moved to China last year, includes in the picture a Chinese flag, looming dangerously behind the three American ones. It’s a strange presence, at first not noticeable but later overwhelming. Here the perspective is reversed so that the biggest flag, the most distant from the viewer, embraces the smaller Stars and Stripes in the forefront. Art is not an exception to the radical changes the world is witnessing today, as the East rises and Western declines. Reinterpreting the image of such iconic objects the artist reflects provocatively on the idea of a new world order and of new desires. Another project by Marri investigates in a different way the theme of exhibition. In Tanzania and in other part of Africa, albinos’ organs are collected and big sums of money are paid to get hold of them in illegal markets, as they are believed to be essential ingredients for various magic rituals. The organs of an albino are the same colour as those of any other human being; the series of drawings exhibited here instead represent those organs as completely white, colourless. Although they’re simple and inaccurate sketches, these drawings have been framed and exposed as if to acknowledge the intrinsic value and desirability of the depicted object. Here the aesthetic operation confers to the desired object the dual aspect of attraction and repulsion epitomized by the macabre collection. Found objects recur in the practice of couple of artists Meng Jin and Fang Er conveying a poetic and a fantasy of space. 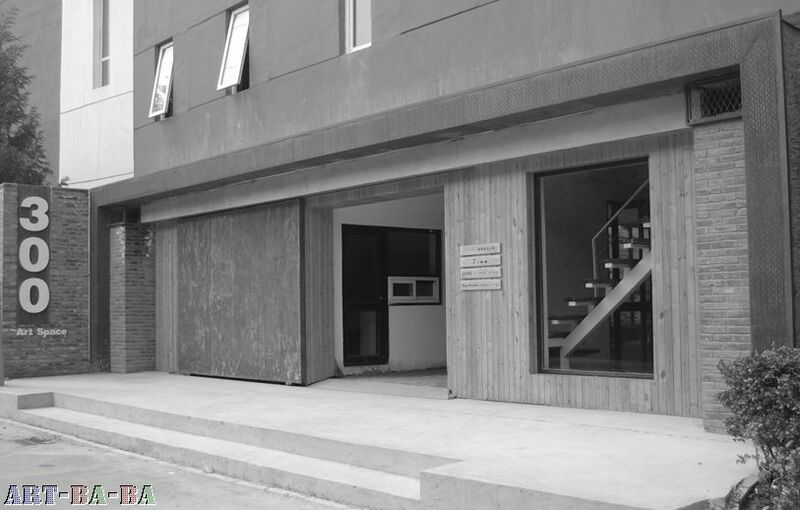 Interested in urban life, architecture, memory, their works discuss the interrelationship between physical building, objects and their social context. In the new series of photograph “Love Hotel”, the scene is shot inside those hotels where couples go for sexual related activities. Cheaper than normal hotels, they are usually located in city suburbs, near highways, close to stations or in industrial areas. Their architecture may be garish and lit with neon lighting. However, some of them come with very ordinary looking buildings, distinguished mainly by having small, or even no windows. For many of their users, love hotels create fantasy and satisfaction feeling that their routine life cannot provide. By tying up the objects found in the room, furniture and the room space become performers the artists work with. Inspiration derives from the feeling of intimate human relation (also preserved in the room’s objects) and a sense of mystery related to these places. Other works integrate the exhibition concept. “Every Room is Illuminated” investigate the grey area between reality and perception. Printed on rice paper these photographs stage an optical illusion referring to what remains in our vision after the exposure to an intense light. Through this process rooms illuminated by intense light of chandeliers in institutional sites (all places connected to power) are cleared of all objects, only the lights and the reflection caused by lights remain visible (the afterimage). Spatial boundaries and details of the rooms are left open to interpretation. A video sequence loops inside a white TV box installation showing the ‘systematic’ confusion of a city that brings objects to the edge of their realization and drops them back into the chaos of random noise. A visualization of the process between construction and deconstruction, this animation is followed by two videos of abandoned areas in which objects appearing in slow succession or under the flash of a pale light create the sensation of a tactile space in movement. Places that have lost their dynamic as spaces can be found in a state of in-between. Objects can condense the memory of those places within the dialectic of light and obscurity. 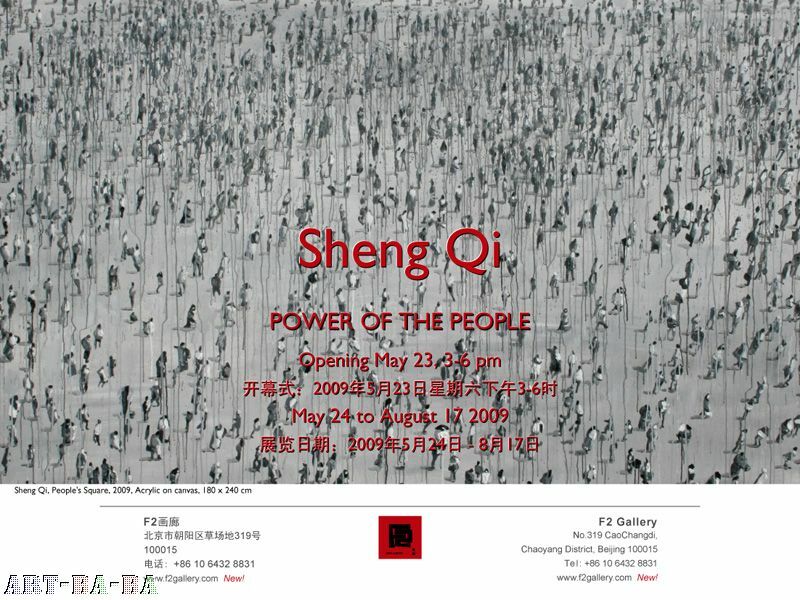 Shanghart Beijing is pleased to present the latest work of Shanghai-based artist Zhang Qing. Entitled Don’t Go So Fast, the exhibition presents a cycle of photographic and video works set in the mud cave-homes of Shaanxi province, one of China’s poorest provinces. These images depict a group of attractive young professionals, wearing the signature name-brand uniform of the urban upwardly mobile, as they inhabit the signature ramshackle spaces of China’s far interior. Despite their incongruous surroundings, Zhang’s subjects carry themselves as if they had never left Shanghai’s Xujiahui or Beijing’s CBD, frenetically pacing in and out of humble homes as if these buildings were the gleaming office towers of the coastal cities. Their actions play out not only against the backdrop of these rural surroundings, but also against a series of outlined images of developed splendor which the artist has scrupulously chalked onto the interior and exterior walls of the village dwellings. Here, a young woman applies lipstick, sitting on a fire-heated kang with an image of a canopy bed from Dubai’s most luxurious hotel behind her; there, the assembled group stands between a pile of corn stalks and a peasant home across which runs a drawing of the Pudong skyline. 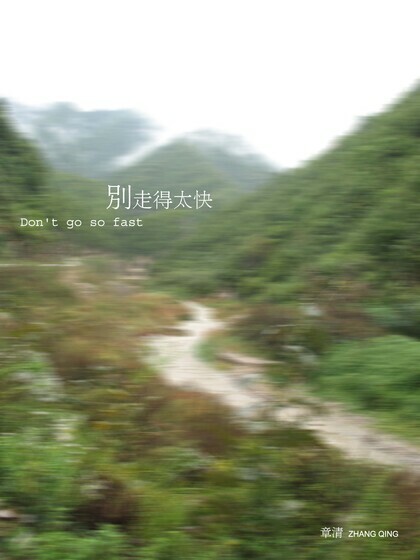 Don’t Go So Fast weaves images still and moving into an extended reflection on the disparities of China’s development and the technologies of control which make that development possible. 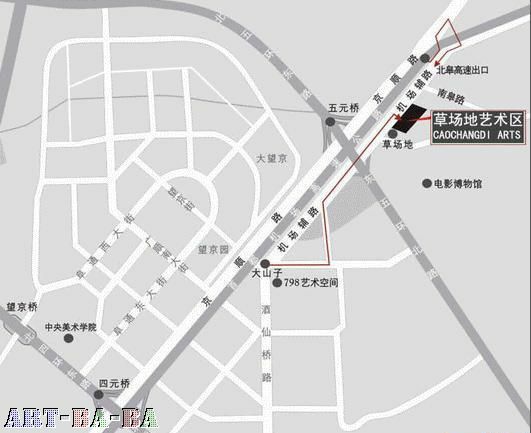 At the heart of the project lies a nine-screen television wall, showing a rolling loop of footage shot by static surveillance cameras placed around the village. Unlike in his posed still photographs, here Zhang Qing abandons control over his lens in favor of an omniscient, "neutral" perspective identical to the one taken by the thousands of security cameras that audit life in cities around the world each day. The cameras’ grainy remove from their subjects, along with the resolute stillness of their angles, belies the intricacy with which the artist has scripted the actions which they record. Installed in configurations that mirror the architectural layouts of the spaces in which it was shot, the works manage to drive home to the gallery-going audience the disparity between these two basic poles of contemporary China. This expansive photographic and video project continues a turn toward the filmic—and a bending of the line between fiction and reality—that first emerged last year in Zhang Qing’s video installation Don’t be Cruel. For that piece, Zhang tracked down individuals he remembered for having given him dirty looks during his childhood, and subsequently layered his intricately crafted moving portraits of these individuals flashing their "mean" expressions over his own voiced recollections of the incidents that led to such displeasure, or perceived displeasure. In this exhibition, Zhang pushes this investigation further, choreographing the movements of a team of actors in a spectacle that courts realism even as it defies reality. Zhang Qing, born 1977 in Changzhou, Jiangsu province, has been a key, if underappreciated, voice in Shanghai’s experimental art scene for nearly a decade. After an undergraduate training in architecture, he participated in a number of the key alternative exhibitions of the millennial moment, including Home? (Shanghai, 1999), Parabola (Chengdu, 2002), and It’s All Right (Hangzhou, 2006). 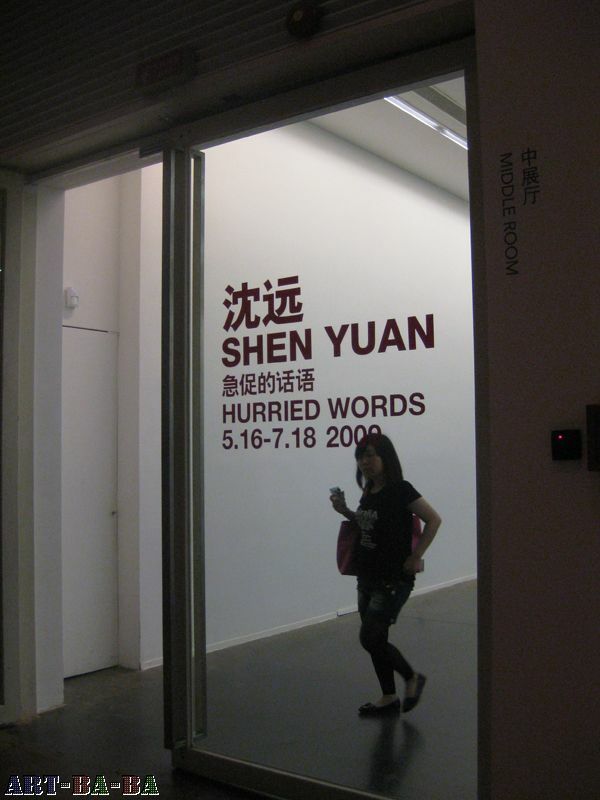 His first solo exhibition, Frame, was mounted in 2007 at Shanghai’s BizArt Center. Do you really know things? The recent “Bottom” series by Hong Hao make us think twice about the question. The “Bottom” series, a philosophical extension of his “My Things” series, turn things that have always been identifiable specious. In this new series, Hong Hao presents collections of the “bottoms” of various everyday objects that he has obtained with by scanning, which reveal “another side” of things commonly seen and used in our life. It is a way that eliminates the property of “function” of things and focuses on the abstraction of the form and color of them. Defamiliarization of our acquainted things, the exhibition leads the viewers to the philosophical reflection on their knowledge and perception. The collective presentation of the “bottoms”, in one way, deconstructs the individual identity of things, and in another, reveals that in the consumer society, the multitude of consumable goods have been eliminating the cultural identities of things.